LEXINGTON, Ky. (March 5, 2018) — The spirit of innovation and entrepreneurship is alive and growing at the University of Kentucky. 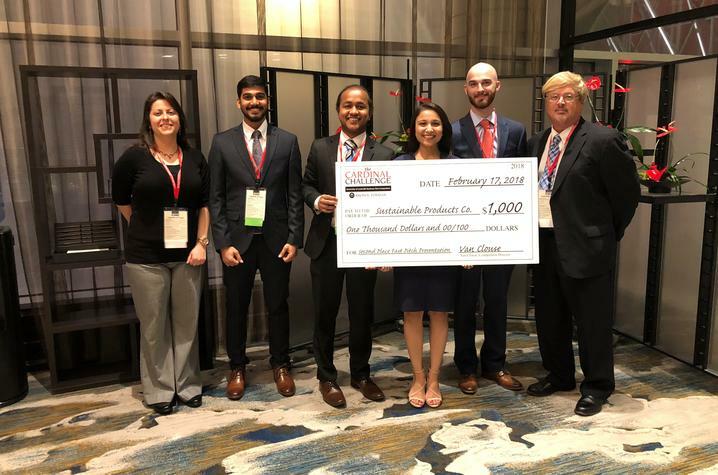 Recently, two teams of UK students, Team Fluxomics, from the Markey Cancer Center and the College of Medicine, and Team Sustainable Products, from the College of Engineering, represented the university at the Brown-Forman Cardinal Challenge held at the University of Louisville. These teams are a part of the Bootcamp program in UK’s Von Allmen Center for Entrepreneurship (VACE), housed within the Gatton College of Business and Economics. This annual business plan competition at UofL allows MBA and graduate students from 12 of the world's leading entrepreneurship programs to present new business concepts and awards students for innovative thinking. Feedback from seasoned judges including venture capitalists, angel investors and successful entrepreneurs allows students to be able to think bigger and brighter and work towards expanding their startups. The challenge brings 60 exceptional students together for business plan and fast pitch competitions. The Sustainable Products team won second place and $1,000 in the fast pitch competition at the event. Von Allmen Center Executive Director Warren Nash said, "Both the Sustainable and Fluxomics teams did an excellent job in presenting their technologies and processes, and the underlying commercial potential. Each team received very valuable feedback from the judges as to how they could build upon and improve their business and revenue models in order to advance these businesses further down the commercialization pathway." All students who participate in the competition walk away with exceptional experience that helps them further their career skills and launch entrepreneurial ventures in several industries. Meanwhile, UK and the VACE will have seven teams of students presenting at the Idea State U Regionals at Asbury College on March 27, and two teams will be presenting at the Alltech Innovation Competition held at the Bluegrass Community and Technical College's Newtown campus on April 14.